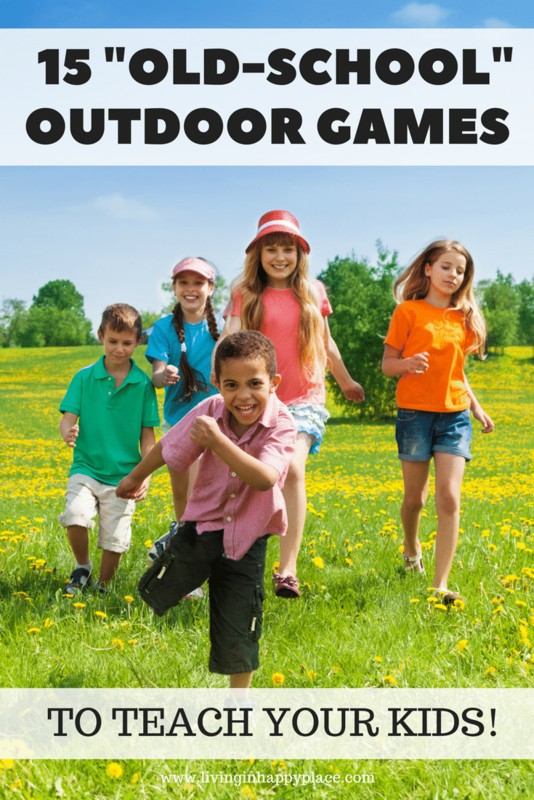 Outdoor games for kids 15 outside games straight from your childhood! Preview: The games we played (outside): 15 old-school outdoor games for kids straight from YOUR OWN childhood! Remember the good old days when we used to play outside all day and night? Tag, red rover, mother-may-I…. all those outside games for kids that didn’t require toys. 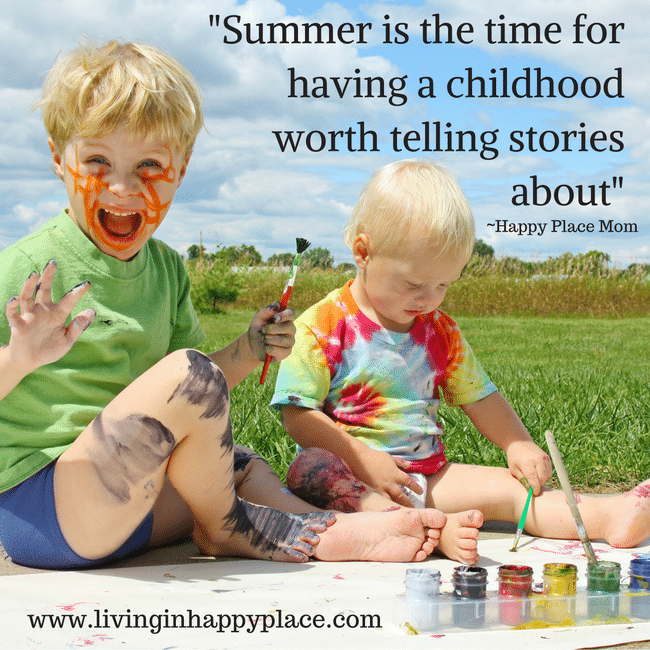 Reminiscing about all of those fun summer nights is such a great way to bond with your kids and tell them old stories about your childhood. You can even get out in the yard and teach them some of the games kids have been playing for generations! If you are looking for the top outdoor games for youth to play at school or in their own backyard, these all-ages games will bring you back to your childhood and show your kids some good, old-fashioned fun! If you are super excited to get to the free, printable, full list of top outdoor games for kids, scroll down to the form and I’ll send it right over to your email! As a kid, I can recall playing outside from breakfast until well after sundown. It took at least four warnings of “you’re grounded if you don’t get in this house NOW” before my siblings and I would begrudgingly go inside. I remember moving into a new house when I was about five. On move-in day all the neighborhood kids came to play in our yard. I thought it was the best day of my life. It felt like 100 kids came to run and play with just me. (In reality, it was more like 10 kids and I was really young so they were probably playing “around” me rather than “with” me- but I felt like a celebrity!). In elementary school, I pedaled my bike for miles pretending to run from the Fratelli’s with (the imaginary) Goonies . Outdoor games for kids were LIFE. Oh, to be young again! Today kids go outside and have no idea what to do. I’m not sure our parents ever worried about the benefits of us playing outside (other than getting us out of their hair). Going out to play is just what kids did. It is a part of childhood that is central to developing who we are physically, emotionally, and socially. While kids are still getting outside, the nature of play is changing. One study found that the time children do spend outside involves electronic media in some form. Research evidence shows that children and teenagers need adequate sleep, physical activity, and time away from media. Active play, especially when outdoors, builds strength and physical coordination and helps prevent obesity (source). 6-17 years old- 60 minutes or more each day. Addiotnaly, most of this activity should be vigorous. “Children and adolescents are often active in short bursts of time rather than for sustained periods of time, and these short bursts can add up to meet physical activity needs”. 18- 71 years old- I am including this information as a reference and a reminder that we need our exercise too! (Don’t neglect Mom!) “Adults should do at least 2 hours and 30 minutes each week of aerobic physical activity at a moderate level OR 1 hour and 15 minutes each week of aerobic physical activity at a vigorous level”. This is not meant as medical advice. Always consult your child’s physician with questions about their health/development and before starting any new routines. 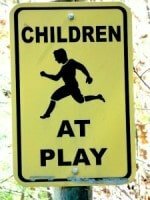 Play is good for the mind, body, and soul of a child. We used to go outside because it is really all we had to do. Cartoons were only on television on Saturday mornings. We didn’t have On Demand or Netflix or iPads- we went out to play because it was our best option. It still is the best option for kids- they just need a little reminding! Circle with Disney– I just got this on Amazon Prime Day and it is all around amazing. This little device is super easy to set up and allows you to control the time spent on screens (down to timers for individual apps) for each device in your house. You can pause the internet on any device, review time spent on each app, and set a “bedtime”. One more trick- use it for your own phone too! I set a 30 minute limit per day on Facebook for MYSELF. Sometimes we parents need the same motivation to stop staring at our screens! Electronic rules sheet– Make a checklist of things that must be complete before screens can be used. Make sure to add things such as “read for 30 minutes” and “play outside for at least 60 minutes”. Then set a limit to how much time they do get once the checklist is complete! -Give them ideas– If they get outside and just pout, try giving them a few suggestions to get the fun started. Their imaginations will take over once their bodies get moving! -Plan Family time that is screen-free– We had a blast doing the 7 Day Family Time Challenge taking just 30 minutes a day to try these family activities. I had so much more fun than I thought I would and now it is part of our routine! We often hear people say that kids don’t go out and play anymore. They spend too much time on electronic devices and should get out and run. Well, guess who else needs to put down the phone/iPad/remote control- us parents! Let’s skip the expensive gym membership and play some free, old-fashioned tag! Playing outside games without kids is a great way to get some exercise and create family memories bonding with our kids. Here is the list of the top outdoor games for kids. They are easy and fun for kids of all ages! Mother, May I?- You always let your best friend win. Simon Says- Kids will love to see their parents acting silly! Colored Eggs- The dialogue is the BEST part of this game. If you’ve never had the pleasure, here’s how we played: Someone is the wolf, someone is the hen, and everyone else is a colored egg (each egg thinks of a color in his/her head but doesn’t tell the wolf). The wolf comes knocking on the door and mother hen answers asking what he wants. He responds “Colored eggs”. She says “I don’t have any colored eggs”- then the eggs make peeping sounds. The wolf asks “What’s that then?” Hen: “Just pots and pans rolling down the steps”. The wolf says “Let me see” then (gently) pushes mother hen aside and starts guessing colors. When he guesses your egg color, you have to run around a designated area and back to mother hen without being tagged. The last person who isn’t tagged is now the wolf. Best. game. ever. Monkey in the Middle- There was always that one kid who got stuck in the middle forever! Swing the Statue- Silly, fun game. One person is “it” and takes each player by the hand/arm and swings them around. However the second player lands, he/she must freeze in that position (like a statue) and hold it for the remainder of the game. Whoever falls first is now “it”. What outside games did I miss? Now, I’m in my 30’s so recalling those old outdoor games for my kids is harder than I want to admit. I had to poll family & friends to gather a list. How’d I do? Did I miss anything? Our childhoods were defined by these games. Let’s teach our kids and keep these games alive! I print this list and keep it on my porch. With all the variations, I bet we could keep busy all summer! Get the printable version below!!! What yard games did I miss? What games did you play outside? Be sure to share this on Facebook and “tag” all those old friends you used to play with! Add your favorite outdoor games for kids! 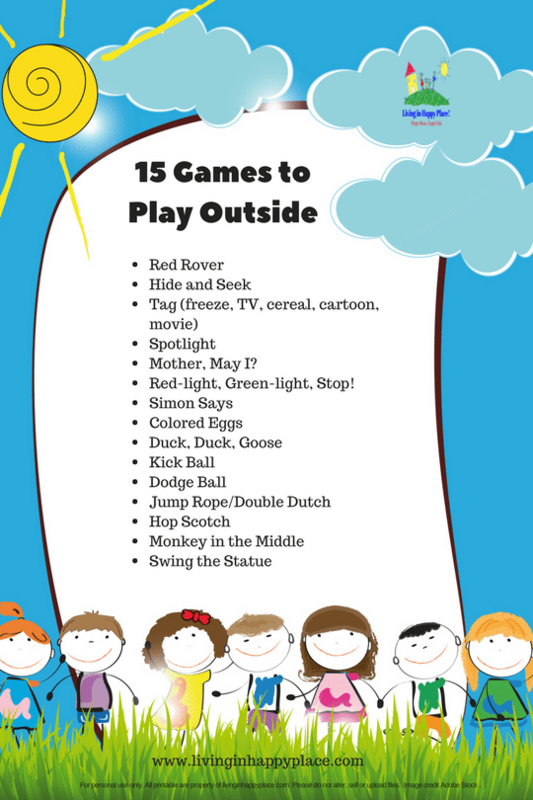 Outdoor Games for Kids Printable List! Subscribe and get "15 Outdoor Games" list sent to you via email so you print it out and keep the kids playing all summer long! Freeze tag! Cops and robbers! Tunnel Tag! Yes yes yes! Wow what is tunnel tag?! I never heard of it but it sounds so fun! I think some of us (ie: me) need to be reminded how to play some of these again. Maybe a post about each game’s rules? Great idea Jessica! I will get working on that. If you are on the newsletter list, you should be notified when new articles are published. Thank you for the great suggestion! We used to play Colored Eggs as a kid in Texas too! Any time I mention it people look at me like I have two heads. Such a great game. I’d love it if you could add more games for parents of an only child. Even better, agame I can play with my 6 year old while dad is at work. Thanks for sharing! I’m so glad other people played this game too! It seems like not a lot of people know about this great game! I will work on some 2 player games for outside. Great suggestion! Thank you! YESSSSS! What I am looking for! I still play Hide and Seek, Kickball, Hop Scotch with my kids, tho I want to introduce them to Tug of War, Egg and Spoon Race, Potato Sack Race, and even forgot about Red Light Green Light game. Isn’t it just the best to be able to share these games with our kids?! We thought we were just having fun with our friends, but it turns out we were making memories that would last our lifetime!